But why should we be surprised? War has always been a racket. And if you don’t believe me that forever war is forever profitable – for some, I recommend that you read War Is A Racket (1935), a classic polemic written by U.S. Marine Corps General Smedley D. Butler. Twice awarded the Medal of Honor, Major General Butler turned against military adventurism in the 1930s as he saw how his efforts and those of his men were exploited by elites to expand corporate wealth and power, even as they exempted themselves from the hardships and dangers of combat. 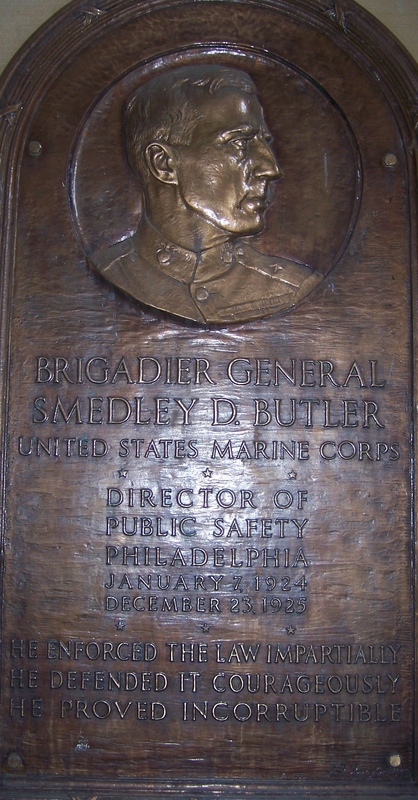 Plaque in Philly in Honor of Smedley Butler. Photo by author. Unless we heed Butler’s advice, debilitating wars will continue. They will continue because perpetual war is simply too profitable. In the racket of war, the chief racketeers are easy to identify. As Butler knew, just follow the money. Posted on May 30, 2013 by wjastorePosted in US Military, US PoliticsTagged casualties, imperialism, militarism, military, PTSD, Smedley Butler, veterans, War, World War I, World War II. I was watching the Bill Maher Show this past weekend on HBO. Generally considered a liberal and a free-thinker, Maher argued that U.S. military forces had to stay in Afghanistan to prevent a resurgence of terrorism. He and his guests seem to have forgotten U.S. military testimony that roughly 20 terrorist groups are currently present in Afghanistan; indeed, that the presence of American troops has attracted more terrorist activity, even as the Taliban has increased its control and the drug trade has vastly expanded. How is long-term failure over 17 years an argument for an even longer “enduring presence” by U.S. troops? How long should those troops stay — forever? I so, so agree with all of this. When there are so many totally logical arguments against the pursuit of war, why do we get more and more of it? Because of profit, yes. But the profit goes to the few: why can we not get the huge majority to reject war as civilised man’s response to a problem? This site, and many others like it show that thoughtful and committed citizens abound. Why are we not changing the world?